On Saturday I walked out of a press conference and into the tail end of a parade. Or rather, all that was left was the banner and an intriguing Batmobile. 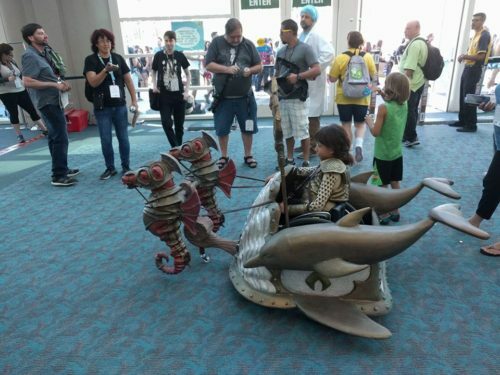 It turned out that there had been a proud display of cosplay, all of children, and all of their wheelchairs. 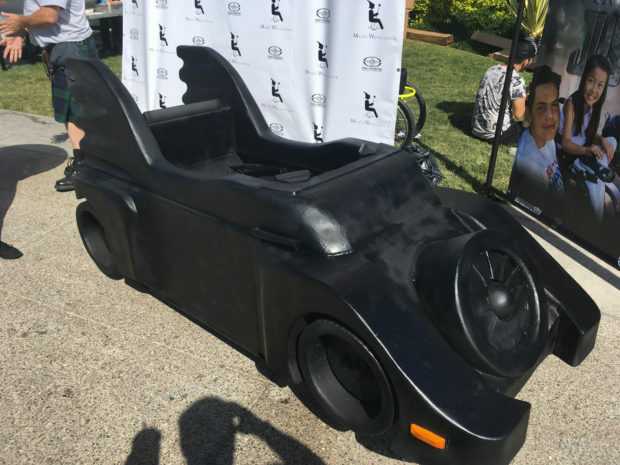 The Batmobile was tricked out with sound effects and lights (though it was a sunny San Diego afternoon, so I have to take their word for it). Built by volunteers giving a little light to the lives of children in wheelchairs, this car was one of the most beautiful things I’ve ever seen. Mainly because at Comic-Con, I do love seeing reminders that people ARE using their powers for good. This wasn’t a one-off cosplay; this was the work of Magic Wheelchair. Founded by Ryan and Lana Weimer, the organization exists to give Halloween and conventions an extra bit of magic. With parents’ permission, children submit videos of what they would like for their wheelchair, and the non-profit activates their network of builders, ideally finding someone local to the child. A look at their Pinterest page reveals creation from fire trucks to TIE fighters to… Chloe the Mermaid riding a sea turtle. These aren’t just cool; they’re epic. Maybe you’d like to donate money, or maybe you have powers that you can use for good. (My own costuming skills are at best two steps above Ben Cooper.) In either case, you can help put smiles on the faces of some children. And that’s pretty good.